Did Airtel put its Online Recharge Customers at Risk by Revealing Mobile Numbers & Handset Details on the Web? With ever growing identity theft incidents and economic frauds, mobile and internet users are required to be very vigilant about whatever they do. Whatever be our attempts to safeguard our data what can be done if someone responsible for safe handling of data is not caring enough? This exactly was the situation with Airtel customers for a good part of the time. While telcos like Airtel provide reasonably good online facilities, someone who thinks a little more would be able to harvest decent amount of data about their customers – the mobile handset make, number of recharges done etc. If an user attempts to obtain mobile internet settings from Airtel website (link not attached on purpose), the confirmation screen displays the model of the handset. This is fine if you are doing this for your handset, it is certainly not OK if you are keying in some random phone number. For anyone to spam any Airtel number with innumerous settings messages at any time of the day. There is also a remote possibility of hi-tech mobile thieves using this method to identify their prey once they get a list of mobile numbers in their area. Airtel’s prepaid recharge website also provides the facility to check transaction details for a week’s period. The site just requires a transaction ID or a prepaid number for checking the details. Making things worse is the absence of any second factor of authentication like OTP. Once a user completes a transaction a transaction ID would be generated. Given the fact these transaction IDs were sequential i.e., the next user anywhere in India would receive the next number as the transaction ID (check the numbers in screenshots), anyone could obtain sufficient information about a user including mobile number, recharge values and hence his/her usage pattern. Even the mode of payment used is displayed. A bit of social engineering like search for the mobile number in Truecaller like website will provide the name and location of the user. This search can further be extended to other social networks to obtain further information. We had written about this issue to Airtel few days ago, and it appears that they have fixed it now. Readers must note that this issue was open since months, and we can’t think of how many mobile numbers have fallen into wrong hands? Who is to be blamed for this – Airtel or the company who designed the website? 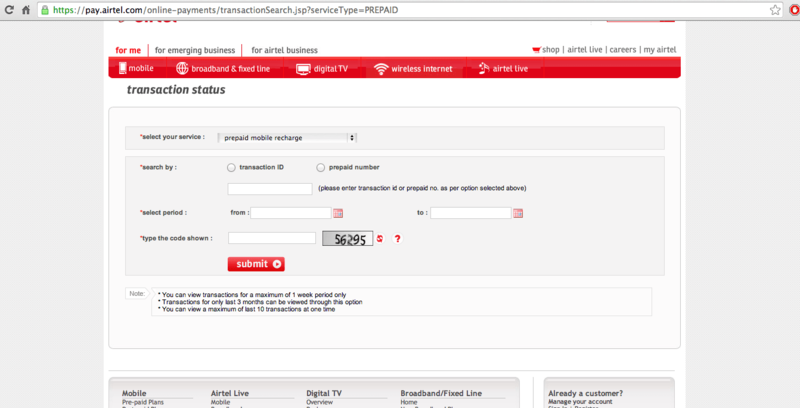 Now transaction search requires mobile number, and Airtel sends an OTP to proceed further. So your data is safe in terms of transactions but the first issue of handset model being displayed is still on. This design flaw from Airtel has disclosed customer information, usage pattern, mode of payment of categories like Postpaid, fixed line/broadband, digital TV subscribers. Have you ever received random OTA Settings from Airtel or any other operator? The network link was interrupted while negotiating a connection. It used to be easy to recharge or pay before, but not since March 2015. Other online payments are going alright, so it cannot be the computer or internet connection. The cause and solution must be something in the Airtel systems. I have a friend of mine who can activate any service of airtel just with the phone number of the person, thank god i don’t use Airtel!